If you haven't tried one yet...go to Taco Bell and get the Cheesy Gordita Crunch! Excellent with Po' Boy Lemonade! It's been great having my parents in town for the last few days. Yesterday, we took a little trip down memory lane and drove about an hour south of Frisco to Waxahatchie to visit my dad's old stomping ground, Southwestern Assemblies of God University. Of course, it's changed quite a bit in the 50 years since my dad attended. But some things haven't changed...I was surprised to learn that the dorm my dad lived in is still there and being used. I mentioned it to John McKinzie this morning, and he told me he lived in the same dorm when he went there! I haven't been out of college as long as either of them, and all of the dorms that I lived in have since been torn down! (I guess I was a little harder on them than they were). I enjoyed meeting one of dad's college buddies, Earl Moore, who has retired and moved back. When they were in school together, Earl's father was the Dean of the school. It was fun hearing stories about how they would "bend" the rules together. Of course, sometimes the rules weren't bent. My dad tells that he went over to Earl's house to hang out one night, and came back to the dorm late. When he was asked where he had been, he said he had been at the Dean's house. His connections didn't matter that time, and he was forced to stay on campus the next day. But my favorite story of the day was when my dad was awakened by the assistant dean telling him, "Get your car out of the women's dorm lobby!" The dorm he was talking about is still in use, but it is no longer a women's dorm. There are stairs leading up to the front door. I guess that a group of guys had decided to pick up his car (it must have been small) and place it in the lobby of the women's dorm. He had to get up, go to the lobby and ease it down all of the stairs. Later in life he found out that the assistant dean was actually in on the prank. We had a great Christmas, highlighted by Anne's parents coming in from Tampa. Papa saved Christmas for our family by securing a Wii from a crowded Target store early on a Sunday morning. I'm not sure who loved it more, the kids or the grown ups. Anne's brother Thad and his family came down to spend a couple of days with us...and challenge us to Wii bowling. Sunday afternoon we drove up to Little Rock to stay at their house for a couple of days. One of the big highlights was driving to Pinnacle mountain state park for a little hiking. 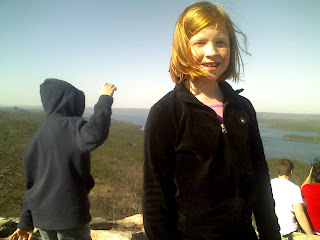 We were only going to go part way up the mountain but my daughter Samantha (9) and my nephew Wilson (6) would not stop. They were determined to get to the top. Of course, that made me want to keep going too, so the three of us finished the mile and a half trek together. I don't think Wilson was even breathing hard, which was amazing because the peak of the mountain was literally rock climbing. Coming down was actually a little scarier than going up because there were no guard rails or anything. I told Wilson I had to hold on to him tight or his mom would never forgive me. :) Here's a picture of Sami and Wilson at the top. Now, I'm back to work getting ready for an incredible 2008. Our church is having a prayer emphasis this week, and as I was praying last night, I was reminded how good God is, and how much He has blessed me. I'm glad that I'm able to know Him, and this year I want to share His love with more people and in more ways than ever before.